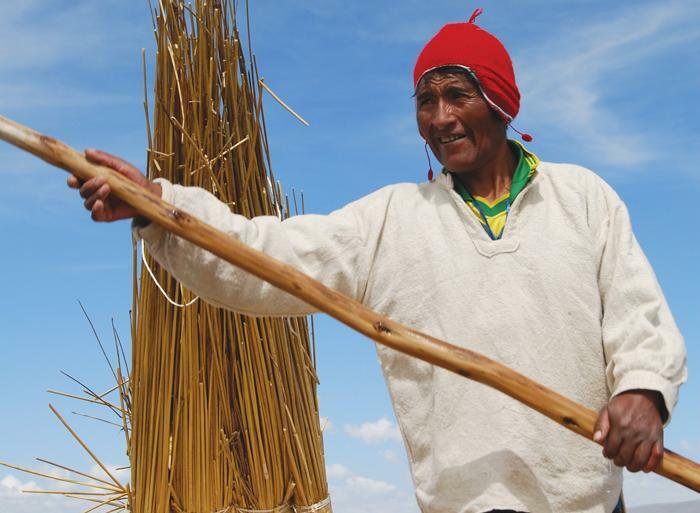 Sail close to the clouds on Lake Titicaca and meet the descendants of ancient civilisations that inhabit its islands. Feel the spongy reeds of the 'floating' Uros islands beneath your feet, learn about unique local cultures and customs at a homestay, and relish the vistas over seemingly infinite waters from the brilliant Taquile Island. This is the world’s highest navigable lake, sitting at a soaring 3,812 m above sea level. On this unique and inspiring trip, encounter the fascinating people and beautiful locations that characterise this evocative place. Bienvenido! Welcome to Puno, a melting pot of Aymara and Quechuan Indian culture where traditional Andean customs are still strongly represented. The town is known as the folklore capital of Peru and is famous for its traditional dances. This morning you will be picked up from your hotel at approximately 7am. Transfer to the pier where you’ll meet your Intrepid local representative. After a safety briefing, collect just the items necessary for your overnight homestay – the remainder of your luggage can be stored at the hotel. Here, high up in the Peruvian mountains, lie the mystical blue waters of Lake Titicaca, the highest navigable lake in the world. From the shoreline, the water stretches out almost as far as the eye can see, its expanses just waiting to be explored. With the fellow travellers in your group, take a slow motorboat to the intriguing Uros floating islands (approximately 40 minutes). Enjoy an hour to explore this unique place and learn about a traditional lifestyle that’s been around since pre-Inca times. The Uros originally built their islands to isolate themselves from rival tribes. The islands are built from many layers of totora reeds that grow in the shallows of the lake. As the reeds closest to the water begin to rot, more layers are added on top. These reeds are used for making everything on the islands, including the boats that can last up to 12 months. Back on board the boat, sail to your homestay in a local community (approximately 2.5 hours). To get a closer look to the lifestyle in the island you will be welcomed into local homes for an overnight stay on a community island. Make the most of your visit by trying to chat with the host family in quechua, or help out with their daily activities. A game of soccer is also a great way to make local friends. Enjoy a simple but delicious meal and then bed down in one of the local homes. Notes: Hotel details are required no later than 15 days before departure to organise the pickup. Due to the early start, one night’s pre tour accommodation will be required. As you will be heading to a homestay today, we recommend picking up some snacks and perhaps a small gift for the family. We also recommend you take a torch and spare batteries as there’s no electricity on the island, except for some private solar powered generators. Wet wipes can be useful, too, as there is no shower.